Feels like summer. 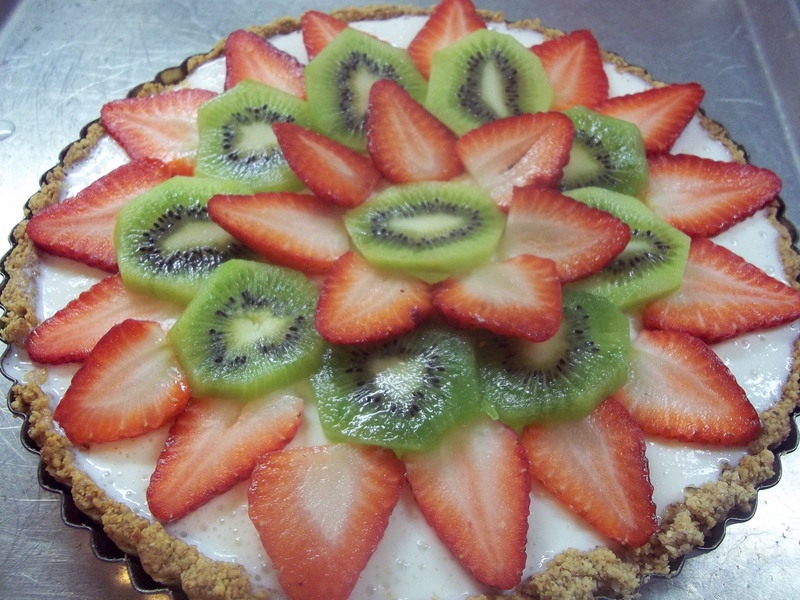 Perfect time for a cool fruit tart! I made the crust for this one with almonds to cut back on my white flour usage, and as another way to add nuts to our diet. It’s a really easy no-bake tart, but for the 15 minutes that the crust needs to stay in the oven to develop its shape. When we had a friends come from out of town to stay with us, along with their five children, I made two of these. As it turns out, none of them cared much for sweets, so crashed after a long drive and a quickly scarfed supper of Chicken Francaise. But believe me, I did not mind having that extra tart in the fridge for the remainder of the weekend. Yum. Grind almonds in a food processor to very fine. Add butter, sugar, and salt. Process until combined. Press into a tart pan with removable side. For the filling, mix together sour cream, lime juice, lime zest, sugar, and vanilla. Chill 30 minutes to allow ingredients to combine and for the sugar to dissolve. Whisk well. Add boiling water to gelatin in a small bowl. Allow gelatin to soften 5 minutes. Whisk into sour cream mixture. Pour into cooled tart shell. Chill 30 minutes or until beginning to set. Layer sliced fruit on top and chill until firm, at least one hour.